The past decade has seen a huge increase in the interest and attention directed toward sea ducks, the Mergini tribe. This has been inspired, in large part, by the conservation concerns associated with numerical declines in several sea duck species and populations, as well as a growing appreciation for their interesting ecological attributes. Reflecting the considerable research recently conducted on this tribe, Ecology and Conservation of North American Sea Ducks examines the 15 extant species of sea ducks from North America. 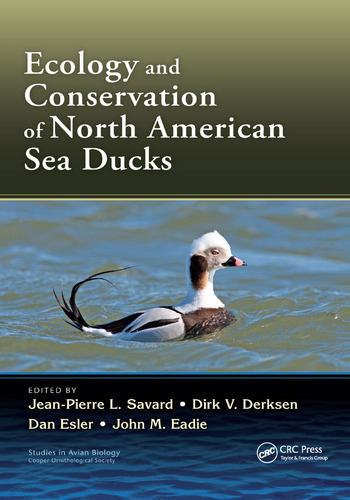 The book presents a comprehensive synthesis of sea duck ecology, documents factors that have caused population declines of some species, and provides managers with measures to enhance recovery of depressed populations of sea ducks in North America. Capturing the current state of knowledge of this unique tribe, it provides a benchmark for where we are in conservation efforts and suggests future directions for researchers, managers, students, conservationists, and avian enthusiasts. Jean-Pierre L. Savard is a scientist emeritus with Environment Canada, Quebec, Canada. Dr. Savard earned his PhD from the University of British Columbia, where he conducted research on the territorial behavior, nesting success, and brood survival of Barrow’s Goldeneye, Common Goldeneye, and Bufflehead Ducks. He has published numerous papers focused on the biology and population dynamics of sea ducks including Common Eider, Harlequin Duck, Surf Scoter, Black Scoter, Long-Tailed Duck, Bufflehead, Barrow’s Goldeneye, Common Goldeneye, Hooded Merganser, and Red-Breasted Merganser. Dirk V. Derksen is retired from the U.S. Geological Survey, Alaska Science Center, Anchorage, Alaska, where he served as chief of migratory bird, terrestrial mammal, and genetics research over a 26-year period. Dr. Derksen earned his PhD from Iowa State University and conducted his dissertation research on Adelie penguins in Antarctica. He studied habitat ecology of waterbirds on the North Slope of Alaska and published a suite of papers detailing the freshwater and marine wetland and terrestrial areas important for Spectacled Eiders, King Eiders, and Long-Tailed Ducks. Daniel Esler is a research wildlife biologist with the U.S. Geological Survey, Alaska Science Center, Anchorage, Alaska, where he leads ecological studies of nearshore marine systems along the Pacific Coast of North America. Dr. Esler examined the effects of the 1989 Exxon Valdez oil spill on the demography of Harlequin Ducks during winter in Prince William Sound, Alaska, for his PhD at Oregon State University. He has published extensively on the biology of sea ducks including Steller’s Eider, Spectacled Eider, Harlequin Duck, Surf Scoter, White-Winged Scoter, Black Scoter, and Barrow’s Goldeneye. John M. Eadie is Dennis G. Raveling Professor in Waterfowl Biology and chair of the Department of Wildlife, Fish & Conservation Biology, University of California, Davis, California. Dr. Eadie earned his PhD in zoology at the University of British Columbia, where he researched the reproductive ecology and behavior of Barrow’s and Common Goldeneyes. His numerous publications cover a diversity of behavioral and ecological aspects of sea duck species including Steller’s Eider, Harlequin Duck, Surf Scoter, Bufflehead, Barrow’s Goldeneye, and Common Goldeneye. "…extremely useful for researchers interested in sea ducks, other waterfowl, or avian ecology in general." "This a must-have book for scientists whose focus is waterfowl. However, every science library must also have it for others with more general interests ranging from environmental contaminants to population dynamics to diseases and parasites to reproductive strategies, breeding behavior, and more. Essentially everything that has been the subject of study within the Mergini is addressed thoroughly and carefully." "...the editors along with the contributors of this book are to be congratulated for an outstanding accomplishment. 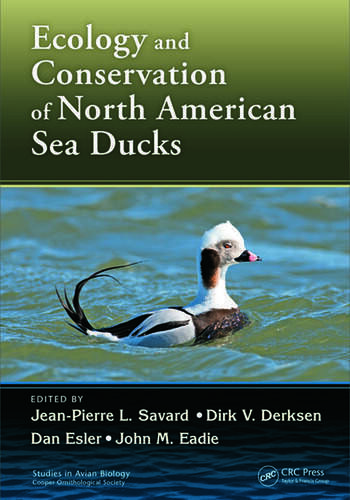 The importance of this synthesis cannot be overstated as many sea duck populations in North America have been declining...This milestone work will contribute greatly to assist both waterfowl biologists and government decision-makers in what future research needs to be done and in the formulation of new policies to ensure the protection of coastal, offshore and inland habitats from further human developments and harmful activities. Ecology and Conservation of North American Sea Ducks should be on the desks of every waterfowl biologist and manager, and anyone with an interest in waterbirds and their habitats."